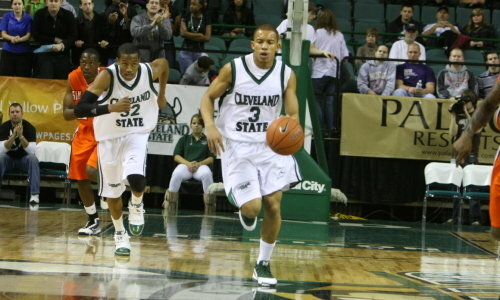 The Cleveland State men's basketball team battles Valparaiso at the Wolstein Center tonight with first-place in the Horizon League on the line. CSU (20-3, 9-2 Horizon League) are in first-place in the Horizon League holding a slight half-game lead on second-place Valpo (16-6, 8-2). The Vikings have won five straight and the Crusaders have won six of their last seven games. "The best team we will play (this weekend) will be here on Thursday," said CSU coach Gary Waters. "This could be for the championship." It's also a matchup of two of college basketball's best coaches with two completely different philosophies. Homer Drew is an offensive whiz with a record of 364-299 in 22 seasons at Valpo (633-421 overall, 33 seasons). His Crusaders lead the Horizon League in offensive field goal percentage (48 percent), which is 22nd in the nation. While Waters is a defensive genius with a record of 93-65 in five seasons at CSU (264-200 overall, 15 seasons). Waters teams take pride in shutting down their opponents. His Vikings lead the Horizon League in defensive field goal percentage (39.8 percent), which is 34th in the nation. "Valpo has a good coach (Homer Drew) that understands the offensive game," said Waters. "It's going to come down to their offense versus our defense. If we don't stop their offense chalk it in the books. "They don't run a Princeton (offense), but they run something similar because they have a lot of back doors and a lot of movement. We got to take something away." The Crusaders have a balanced scoring attack led by Player of the Year candidate Brandon Wood (16 points), senior forward Cory Johnson (15.8) and sophomore guard Ryan Broekhoff (10.1). They play nine guys who average 10 minutes or more. "Wood is as good of a guard as you are going to get," said Waters. "(Cory Johnson) knows he has an advantage on every five man in this league because he's a five-man in a four-man's body. And Broekhoff is playing his tail off. He hits the dagger shots." The Vikings will counter Valpo with their three-guard offense led by Player of the Year frontrunner Norris Cole (20.1), and junior guards Trevon Harmon (13.8) and Jeremy Montgomery (11.1). "I feel that we didn't give them our best shot in the first round," said Harmon. "I think our pressure and our defense will be key in this next game. And if we hold them to a low percentage we will be hard to handle." Waters has two keys to victory. "We got to turn them over and we got to keep them off that percentage (48 percent, field goals). If we don't we're in trouble." Waters also said CSU's bench will play a key role this weekend. In the first meeting against Valpo, CSU's bench was outscored, 19-2. "I'm hoping being at home will relieve some of the pressure for them."